BBC Television’s Masterchef competition captured the imagination of the British foodie public this spring when US-born Tim Anderson took the title with his experimental cuisine. When Roger Protz discovered Tim was manager of one of London’s most intriguing pubs he hot-footed down there to find out more. Feeling peckish? Fancy a pint? What better bar to visit than the Euston Tap in London, run by Tim Anderson, who won TV’s MasterChef at the end of April. Surely he can cook up something sumptuous to match one of the bar’s great beers? Sadly, no. The Euston Tap is tiny – 10 people in and it’s crowded. It’s based in one of the two Portland stone lodges that front Euston Station, the last reminders of the 19th-century station before it was rebuilt in the 1960s. There’s no room for a kitchen and as a result food is reduced to an assortment of packaged nuts while customers can order takeaway pizzas in the evening. Anderson will happily recommend beers to match the pizzas but this is a long way removed from the exotic dishes he cooked on MasterChef. He’s been managing the bar since January and his plan now is to run his own restaurant “with great beers” in London and then a brewpub with sufficient room for food cooked on the premises. The Tap opened last November, part of the Pivni group run by Jamie Hawksworth and Jon Dalton, who also have the Pivni Bar in York and the Sheffield Tap at the city’s railway station: Pivni is the Czech for bar or pub. The emphasis is on craft beers from around the world, a strategy that delights Anderson who, as well as cooking, is a passionate lover of beer. He peppers his beer descriptions with talk of aromas and flavours reminiscent of fresh tobacco, figs, prunes and chocolate. It’s not surprising that such a well-tuned palate should have discovered the delights of cooking at the same time as he was finding the pleasures of craft beer. Aged just 26, Anderson has packed a lot of culinary experience into his travel since leaving Wisconsin. He moved first to Los Angeles, a city with no great brewing tradition itself but with fine beers available from San Francisco. Anderson had fallen in love with Japanese cooking in the U.S. and he grabbed the opportunity to move to Japan to teach English. In his spare time, he travelled the country, eating fine food and also getting a taste for saké or rice wine. The Japanese influence was clear in the final dishes he cooked that won him the MasterChef trophy and blew away judges John Torode and Gregg Wallace: monkfish liver with umeboshi ketchup; jellied ponzu and matcha mayonnaise; Kyushu-style pork ramen with truffled lobster; and cheddar cheesecake with whisky jelly. Only amateur cooks can enter Masterchef but, Anderson says, “you’re almost professional by the end of the competition.” Photo ©PA. While he was in Japan he met and married a British woman, Laura, and they moved to London. He worked as a travel agent, specialising in trips to Japan, became a beer salesman in Denmark – “I wasn’t good at that!” – and then worked as the beer buyer for the Wholefoods supermarket chain. When he entered for MasterChef, he had give up the Wholefoods jobs as a result of the demands of the programme, which included cooking in Australia and New York City as well as London. “What lasts 10 minutes on TV could take a week to film,” he says. “MasterChef is very demanding, with filming one day, one day off, then filming again. But the most difficult thing of all was winning the competition in November and having to keep it a secret until it was announced in April. Unsurprisingly, there’s a powerful international twist to the beers on offer in the Euston Tap, but British cask ale is not ignored. Anderson is a great fan of the style and he doesn’t knock British food either. He raves about English cheese and how well it goes with such specialities as IPA: his favourite beer – the one he would take to the desert island – is an IPA but it comes from Japan not Burton-on-Trent and is aged in saké barrels. The cask beers available are literally on tap: there are no handpumps. 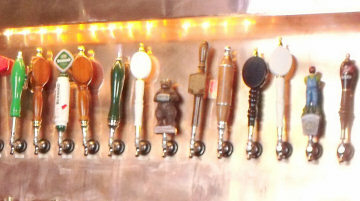 All the beers whether cask or keg, are served by taps in the wall that connect to the beer store (photo right). The eight cask beers, served by air pressure, include Oldershaw Caskade from Grantham, Saltaire Cascade from Yorkshire, Williams Brothers Red from Alloa and Otley Columb-O from South Wales. Keg beers come from further afield: Goose Island IPA from Chicago, Timmermans Peach and Cherry beers from Belgium, Odells 5 Barrels and Sierra Nevade Big Foot from the U.S., Bernard Dark from the Czech Republic, and Schneider Weisse and Mahr’s Weissbock from Germany. 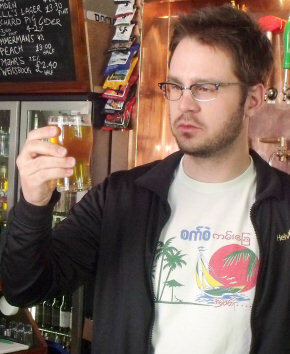 BrewDog is from Scotland but its beer has a special appeal to Anderson: it’s called Tokyo. The bar has no fewer than 150 bottled beers, sufficient to please all tastes. But celebrity has its price: in the hour and a half I was in the Tap several people – mainly women, it must be said – came in, shook Anderson by the hand, wished him luck and then left, without buying a beer. More serious customers can take a tour of the beer world by surveying the two cabinets of bottles either side of the bar. 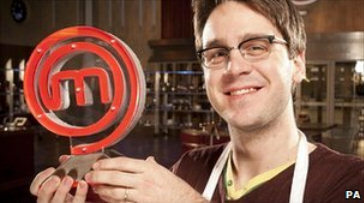 Tim Anderson is the youngest person to win MasterChef and he is now planning for the future. When filming ended, he took a month off to recover then looked on the Society of Independent Brewers’ (SIBA) website for a job. Up sprang the Euston Tap, which wanted a manager with a good knowledge of beer. His experience has paid dividends. He has doubled the takeover of the bar to £13,000 a week since he arrived in January and he plans to increase that to £15,000 before he leaves. Don’t ask for the “wet-dry split” because the Euston Tap, like the pop group, is Wet, Wet, Wet. Before he leaves to pursue a culinary career, he would like to install a barbecue outside: there’s a tiny beer garden alongside. He also plans an IPA festival and he’ll be appearing at the BBC Food Show in Birmingham in June. In the meantime, catch him while you can in the Euston Tap. It’s worth missing a few trains for the experience.